I must admit that until very recently I was a bit confused and skeptical about the concept of facial waters. I wondered if they were just an overpriced, bogus product promoted by skincare and beauty companies to make money off of suckers. Ok – so I was more than a bit confused and skeptical about this product. Recently I finished reading Leslie Baumann’s book The Skin Type Solution and while I wasn’t the biggest fan of her book (see my review) I did learn a few new things including what exactly facial waters are and how they benefit the skin. I have to say that I was intrigued. Facial waters can definitely be of benefit for those with dry skin or as a temporary solution for when you are in a low-humidity environment like an airplane (see my earlier post Airplane Travel and Your Skin for more skincare travel tips). What Are Facial Waters and How Do They Benefit The Skin? Facial waters come from thermal springs. They do not contain chemicals such as chlorine that are added to our tap water to keep it free from algae and other organisms. The constituents of the water vary according to the source. 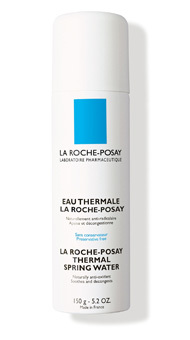 Vichy water contains sulfur, while La Roche-Posay water contains selenium and has been shown to be effective in treating eczema. Both selenium and sulfur can be anti-inflammatory. Spray facial water on your face just before applying eye cream and moisturizer. The moisturizer and eye cream will help trap the water on the skin, giving the skin a reservoir to pull water from. This is particularly beneficial in low-humidity environments such as the dry winter air, on airplanes, in air-conditioning, or in windy locales. Essentially facial waters deposit much needed water and soothing ingredients onto the skin. I like the idea of using a facial water in combination with a traditional moisturizer. If you find that your regular moisturizer isn’t doing the job consider adding a facial water to your regime before throwing away or switching your product altogether. Perhaps the solutions to your dry skin is only a spray away.